I’m going to make a fortune, effective immediately! … which image simply serves to illustrate my preferred – or, should I say ‘accepted’ – approach to investing. 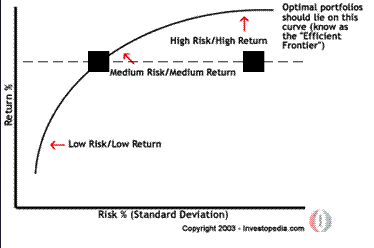 Surely, the quadrant to the bottom-right (where the combination of profit and risk is optimized) is the most efficient? So, why would I want my arrow to hit the target in ‘no mans land’?! there are significant gains to be made with a moderate increase to your risk … however the long term of the investment should moderate that for the endgame result. Technically it is a less “efficient” investment, but only statisticians care about that, not real world investors. … for me, your overall investment objective drives everything. The aim, in my opinion, isn’t to find the optimal investment where ‘optimal’ is defined as sitting on some curve, it’s to find the investment from the limited range typically available to you in the real world that delivers the result that you need. This means, knowing how much money you need; when you need it; and, using those answers to derive your required annual compound growth rate. … and, you will be amazingly lucky, if one of those choices (e.g. as represented by the black squares on the chart above) happen to fall on the intersection of the horizontal line and the ‘efficient frontier’ curve. If not, and if you want to achieve your Number by your chosen Date [AJC: you do, don’t you? ], you will go ahead and make that investment, anyway, even if it doesn’t fit neatly in the quadrant on the bottom-right of the image at the top of this post. Because, as JD says, even if your investment fails, hopefully, you will still be “young enough to earn it back”. We get one opportunity to live our Life’s Purpose; we get many opportunities to make investments to help us get there, but only if we have the mettle to choose the ones that have the potential to meet your minimum required annual compound growth rate. 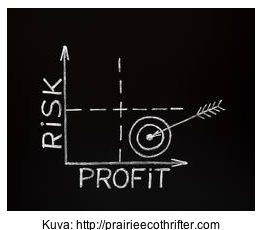 … in fact, the ideal investment is one that maximizes profit at the lowest possible risk. Whilst that is ideal, the real world – at least in my opinion – doesn’t work that way. In this case, you have lucked out! 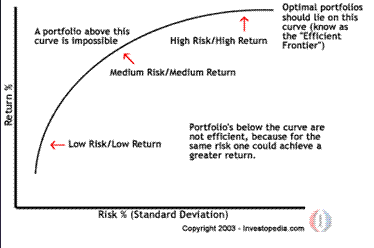 Two of your investments have hit the efficient curve smack on, and one is optimal (i.e. 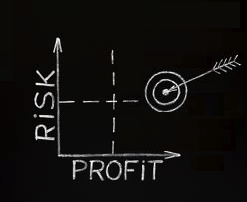 best combination of risk/reward), whilst the other will suit the most risk-averse amongst you, as it is efficient, yet carries the least risk (of course, it also produces the lowest return of all the ‘efficient’ choices available to you). … and, where I think most (but not all) of you should like to position yours, as well. 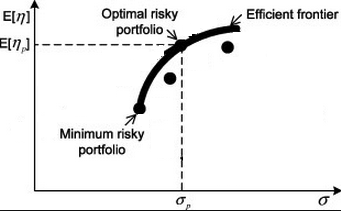 It’s not optimal (higher reward, more risk); probably not even efficient; but, ideal … at least, for my (our?) purposes! Why do you think I actually like to assume more risk? I’ll do a follow up post; in the meantime, I’d like to hear what you think my reasoning will be? Tin Stacker or Kite Flyer? Which one are you? 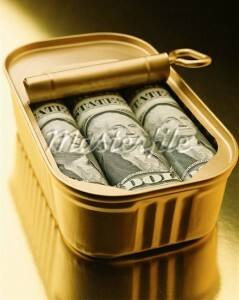 I fly kites and I stack tins. But, I mainly fly kites. And, it’s all because I understand the true value of money. The money that you save has a value today and a value in the future. Aside from money that you save as a short-term buffer against emergencies, or to pay for a trip or other expense coming up soon, the real value of money that you save today is the value that it can provide tomorrow. But, the ‘tomorrow’ that I am talking about is the one that comes on the day that you decide to begin Life After Work. Some call this retirement; others call it semi-retirement; I call it early retirement … but, that’s really up to you. So, a dollar today is exactly that: One Today Dollar. 2. Investment returns grows it – increasing it according to the annual compound growth rate of that asset class. With inflation pulling one way (down), you need to find an investment that moves the value of your savings the other way (up); how fast you need to move depends on (a) how much money you need (your Number) and (b) when you need it (your Date). 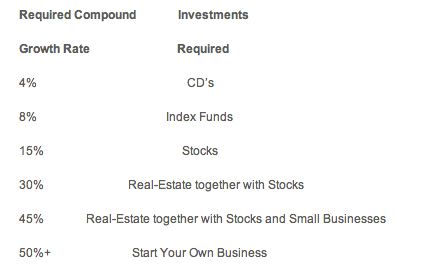 So, how fast do different types of investments grow? That’s why the Future Value of $1 could be $100, in just 10 years, if you invest it in a business. If inflation runs at its historical average of 4% $1 is only worth $1 in 10 years, 20 years, or 40 years! create the proper mindset. then its time to move on to more advanced lessons. EXCEPT that the “proper mindset” that she – and most others – talk about is saving, paying off debt, saving, living frugally, and … saving. Which is great, if you value every Today Dollar exactly the same as a Future Dollar. How many Future Dollars do you need, when you stop work / retire? I’m guessing that Number’s at least 20 to 40 times your current expenses, doubled for every 20 years that you are prepared to wait. How much is that for you? I’m guessing it’s much more that you previously thought. Now, what has any of this got to do with either flying kites or stacking tins?! … exactly as many Future Dollars as you had Today Dollars, no more no less, and not enough? Or, will you take each Today Dollar, and when you have enough, make a Future Dollar Kite (it can be a Business Kite, Real-Estate Kite, or possibly a Stock Kite) and let it soar? … until one flies, with each Today Dollar used in making it becoming 100 Future Dollars? 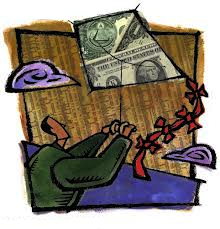 But, I must warn you – even though most of you are tin-stackers by nature, therefore, should not be surprised when your Future Dollar stock is well short of what I would consider a ‘nice retirement’ – I write solely for the kite-flyers out there! 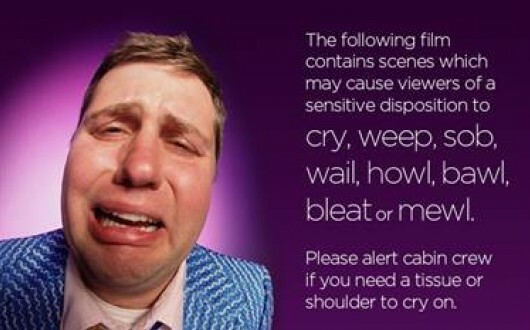 This post will make you cry. But, it is a post that I have to write. It’s one that I have been putting off … and, off … and, off. … one that even I have not dared touch until now. But, I have finally decided to bite the bullet, because there has been a whole generation weaned on an aspiration that, in itself, is a lie. The Myth of The Millionaire Next Door. Most of the millionaire households that they profiled did not have the extravagant lifestyles that most people would assume. This finding is backed up by surveys indicating how little these millionaire households have spent on such things as cars, watches, suits, and other luxury products/services. Most importantly, the book gives a list of reasons for why these people managed to accumulate so much wealth (the top one being that “They live below their means”). The perception after this book was released, becoming an instant – and enduring – best-seller, is that the typical American millionaire is actually your neighbor, the small business owner who has been working for 20+ years on his business, investing (and, reinvesting) its profits rather than spending on lifestyle and luxuries. 2. Who says that you can wait 20 years? Do NOT spend the spare business cashflow on personal lifestyle building (homes, cars, vacations, etc. ); instead, use that cashflow to fund an aggressive investment portfolio, outside of your business: one that will one day grow to replace your personal income i.e. the amount of money that you DO take from the business to live off. When the day comes that this passive income surpasses your personal business income, you become free. However, this freedom does not come simply from saving and investing passively – otherwise, you are simply following the advice given in the Millionaire Next Door and you, too, will slave for the next 20+ years to get there. Rather, this true financial freedom comes from investing your business profits aggressively and actively, with a mixture of your money and borrowed money, in things such as direct stocks (no funds for you! ), and real-estate. In this fashion, you may still need to work your business for 20 years before you shut it down, but at least you will retire a real millionaire (or better) in today’s dollars.